Take one look at the Adidas adiPure IV and you know they are a boot designed around the ideals of class. I have had them in testing for the past 3 weeks and everything about them oozes quality. The adiPure range has a reputation of being a boot designed for the hard working everyday player, and these are no exception. I have some reservations about the actual design, but Adidas have again placed huge emphasis on comfort and performance – both of which excel as expected. For testing, I wore a size 9US FGs in the Black/White/Light Scarlet colorway. I took these boots right out of the box and into my first training session with ease! Seeing as this is the fourth release in the adiPure range, and the other three release have been super comfortable, I took a chance and decided not to spend time slowly breaking them in. And it was well worth it as they performed exceptionally well straight away! Adidas have mastered the art of creating a boot that is game ready right off the bat. I recommend that you at least get one jogging session in them, but if you can’t before a game I wouldn’t be too concerned. Thus far I have got them out in 3 training sessions and 3 games with only positive results. If you can get the right size they will fit like a glove and mold to your feet just like previous adiPure releases. These boots are a top class performer on the field. In fact, I am not sure if there are actually better boots in terms of performance out there, especially when you factor in comfort. 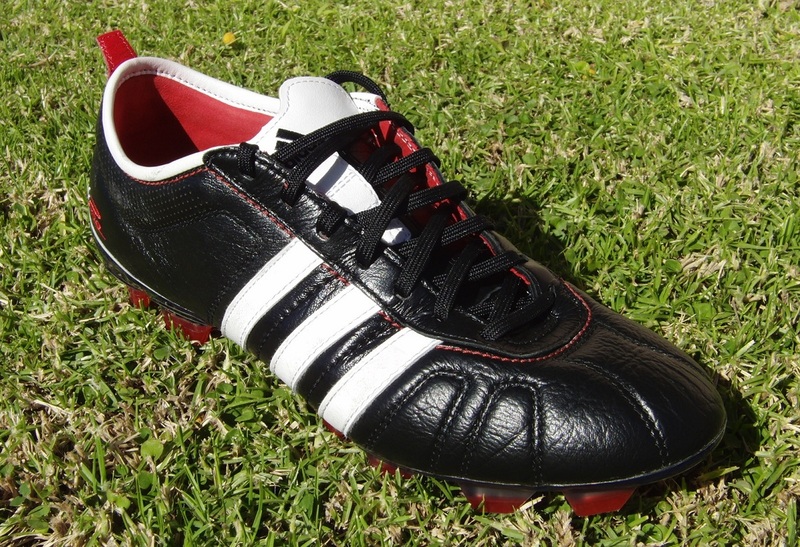 This has always been a main staple of the adiPure range and is what sets this boot apart from others. In this version, Adidas have included a new neoprene pad system around the heel area. This is very noticeable when you feel inside the boot (almost like a spongy lining) and offers great benefits to those who suffer from heel injuries. I love the feel of it on your foot, as it allows the boot to mimic the shape of your heel giving a great fit. All positives in this category! Well, the first thing you will notice about the adiPure IV is that Adidas have moved to centered lacing. This, of course, gives the boot a more old school look and plays off the whole design. 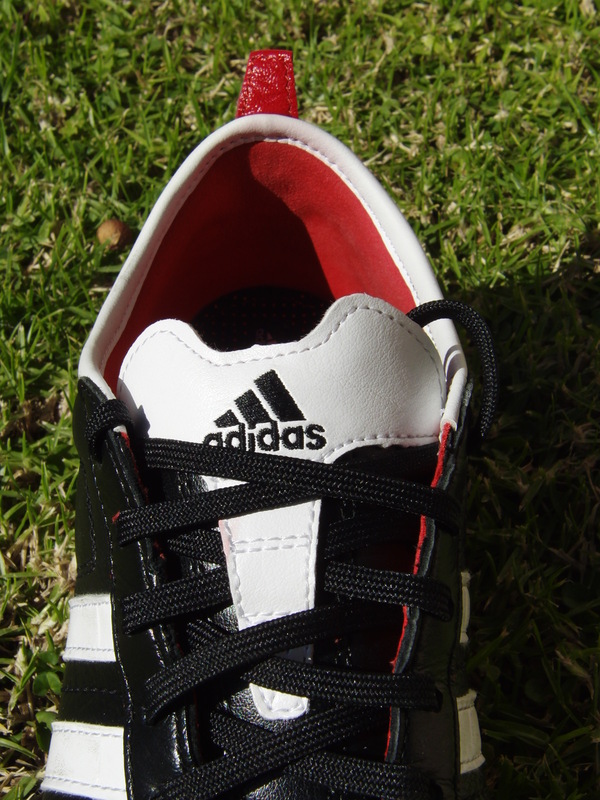 Off centered lacing was used on prior adiPure releases – I am not sure why Adidas have changed it up! The second thing, when looking at the front of the boot you will notice the strange stitching that creates a very unusual look to the boot. Personally, I don’t like how it looks but it does serve a purpose. Adidas have strategically placed the stitching so that the leather shapes and contours to your foot in the most effective way. Overall, the adiPure range has not varied too much. It still holds a classic look and performance has always been at the forefront of each release. The difference with this version lies in the aesthetic changes, centered lacing and the addition of the neoprene lining for extra comfort. If you are a fan of the adiPure range then you are ultimately going to like these. It is extremely difficult to say which boot in the range is “best”, but I do like the new additions to this release and rate them very highly. In terms of which pair to get, it comes down to budget and personal preference. If I could get the adiPure III at a good deal I would take them, but ultimately my advice would be to take a chance and test out the newest boot in the range! Realistically, there are no major negatives about this boot! They perform well, offer great comfort and are designed with durability in mind. But if there was an area I had to pick on it would be the design. I was actually a big fan of how the adiPure III looked and feel that Adidas should have stuck with a similar design (especially in terms of the stitching). Anytime I wear a pair of Adidas adiPure boots, I feel like I am playing in the 60’s or something! They just have an old school heritage feel about them, similar to the Copa Mundial. I absolutely love wearing them and recommend them to anyone looking but a general all around, high performing boot. Adidas already have their speed range of boots covered, but that has not stopped them lowering the weight of the adiPure down to 9.8oz (from 10.6oz in the adiPure III), giving them a slightly lightweight feel. And to finish, the highlight of the boot is the price. Again Adidas have kept the price down (around $139 right now), adding to the absolute value you get if you buy a pair! I’ve tried on these AdiPures but they just choked my foot around the striking area. I’ve always used synthetic, so I’m clueless when it comes to leather. This is kind of a two part question; does leather really stretch THAT much? And how about the new Preds? The older version I tried on fit nice a snug and the shot shield seemed perfect in place. But for my wide foot, the shot shield on the new Preds seemed slightly out of place. The second question is, will the Preds stretch enough to move the shot shield? Like I said, I’m clueless when it comes to leather. the leather should stretch and mold to your foot. If its a little snug then it's good and should fit comfortably after a short break in period. The new predators are synthetic, so don't expect a lot of stretch with those. The AdiPures stretch for sure, though. I bought some a few months ago, and they have definitely molded to my feet. It's actually really common for people to get a size smaller than usual with these cleats in particular, because they are a little wider than typical, and are known to stretch. For me, that was the perfect solution. As long as your foot fits over the sole plate, the leather will do the rest of the work for you. Do these have a fit like most adidas cleats? That would be very slim unlike nikes. I like my adipure IIIs a lot so i just have a few questions. I dont like this new design as much. Do the centered laces get in the way at all? Does this different stitching work as well as the old stitching (is the touch as good)? And, should i get the same size as i have with my adipure IIIs? Thank you for help and this great site. Honestly some of the worst looking boots out there…just my opinion. Adipures are very good, just wish they were wider. I think that the Japan made Mizuno Morelias are a better heritage boot though. Even more comfortable and absolutely sick touch. Yeah I agree with Daman, you really should try out the Morelias. Whoever wnats to check it out motorcitysports.com has great deals and automatically everything is 15% off!!! I hope the upper don't ripped easily like the 2nd and 3rd. adipure iv vs ctr360 ii, which one do you prefer? They fit medium, very much like the previous versions of the adiPure. They are going to fit similar to the adizero rather than the T90 Lasers. The centred lacing system gives them a pretty balanced fit. Yes, definitely stick with the same size. The centered lacing is not an issue, there is extra padding on the tongue that gives you added protection. The stitching allows the leather to conform to the shape of you foot more than in previous versions. If I can get my habnds on Morelias I will test them out! Check the review scores table! From the review and comments above, Adipure IV's seem to run true to size (I own a pair of Adipure III's that I was able to try on at the store and it was definitely size 9 – my regular fit). Interestingly, Adicore IV IN which is essentially an indoor version of Adipure IV ran 1/2 size larger than indicated so I had to adjust from my usual 9 to 8.5 and it is a perfect fit. Anyone here have experienced something similar? 1. I tried on the Adipure III at a shop and i fit nicely into a 9US but could be ok in an 8.5US once the leather stretched and I was wondering will the leather on this stretch where a 9 will end up being too big? 2. I noticed that the laces come pretty far down the boot and leave less surface room at the toe than other boots..is this detrimental to touch or the kicking surface? 3. This is having to do with your scoring chart..what is exactly meant by accuracy? It was just a little concern because it is one of the lower scores you gave the boot…is it pertaining to how accurate your shots and passes are? because that to me wouldn't seem much as the boot's fault.. 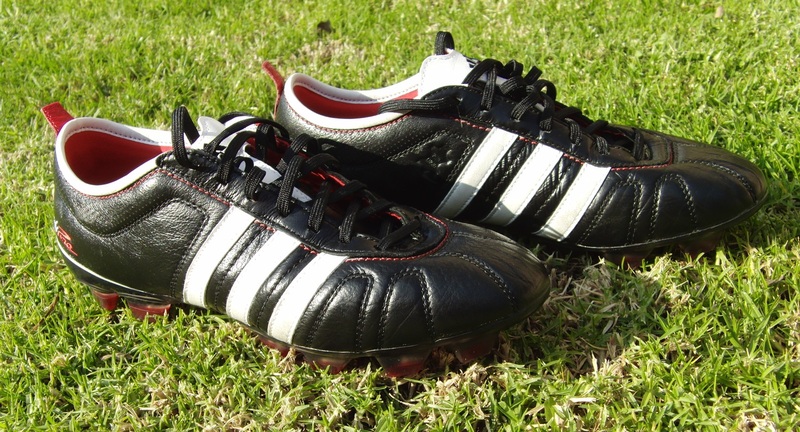 I have an adiPure III, and if I'd have to replace it, I'd definitely replace it with… another adiPure III. I love the black, white and slight gold on my III's, it's the main selling point of the boots! I hate the red in the IV's passionately. I mean, who is Adidas to decide on the colours of a traditional boot?! 🙁 It should ALWAYS stick to the black and white! Looks like the greatness of adiPure ends at III. Looking forward to the adiPure V already. Will definitely not be getting this one. As an Adidas fan, I'm most disappointed. you do know that more than 1 colourway comes out right?? There's nothing wrong with everything else, just, the RED! Damn it! They almost look like a perfect Predator boot, which is suppose to be black with white stripes and red elements. Disappointed to the point of frustration. It's like watching your team losing in a big game. Looks like Adidas has join the bunch of companies (Nokia) in falling into a 'trend trap'. Distinct yourself from Nike, Adidas! My son is a goalkeeper and has been wearing Copa Mundial. I thought we might check these too. He generally wears Adidas for a wide foot and the Copa's have been comfortable. Do you have any particular cleats that you recommend? He plays and practices high school/competitive on both grass and turf. Copas are a great choice – and if they seem to work for him, then these would be another very suitable option. For goalkeepers, the most important aspect of a boot is protection. This in turn usually leads to a little extra power when kicking. Also check out the Puma PowerCat. They are competitively priced and offer what he would need! I recently got some adinovas after hearing many people say they were some of the best cleats at that price range. Since adipures seem to have a reputation of for comfort and short break-in time, I was hoping the adinovas would be the same. I was a bit surprised when I got some blisters in the heel area, since I actually have not had trouble breaking in cleats in the past, and the fit seems fine. Anyone else had this experience with adipures or adinovas? And how long do you think it should take to get them broken in? It is about the same level as the previous adiPure releases. You don't really notice any difference when playing in them. bryan: I have a question regarding the heel of the boot. Is it low as the rest of the AdiPure range? I'm a goal keeper and I've been looking at boots that are confortable as well as durable. My season is over at my school (I'm a freshmen), but I'm planning on playing on my old club team again. I wore the cheap T90 Lasers and I destroyed them because of my very wide feet and practicing every day after school. The real thing I'm wondering is if I should get these adipures, or get the adipure III (keep in mind, I have wide feet)? And I have no clue if I should get the spikes you have or if I should get the 6 spikes for soft ground. We use our beat up "football" field and the grass is tall, and everywhere we play it's never nice, consistant grass. I've seen players from Fernando Torres to Clint Dempsey using these spikes on their T90s. But like I said, it's no EPL type grass, and I've seen myself slipping on the grass because of split second direction changes to dive. Anyways, I need to know about which spikes I should get (if you don't have any clue, give my your best opinion) and if a goal keeper should consider getting these. Thank you for reading this extremely long message and please get back to me when you can. 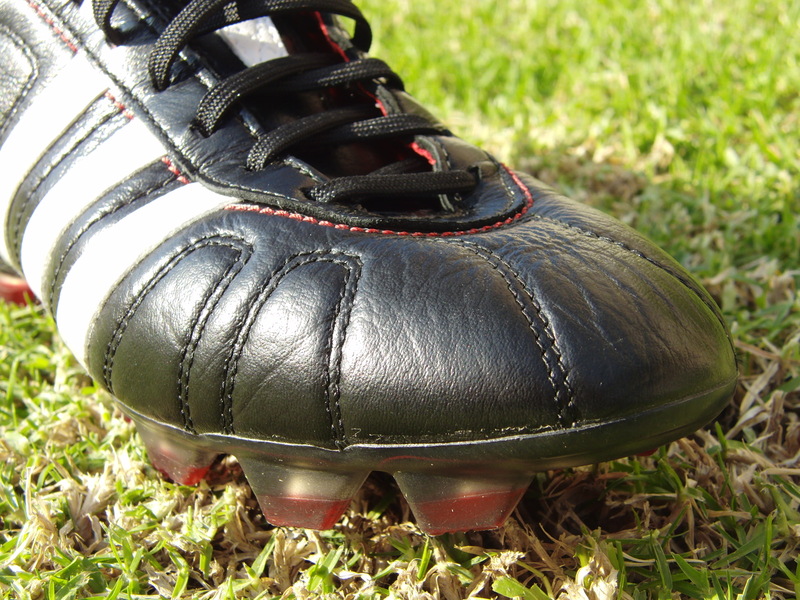 If you are slipping with firm ground studs, you should probably try soft ground studs. Keep in mind that soft ground studs are a little more expensive(why? I don't know). They usually are $20 more than firm ground. You probably already got some cleats though since you posted your concern 30 weeks ago. I have both Adinovas and Adipures. It took several weeks for me to break in the Adinovas. I got painful blisters in my heels. But with Adipure (I have 2 pairs, Adipure 2 & 3) I haven´t had any problems. Adipure has got much better leather, it literally molds to your feet. If you are playing on softer ground, go for the 6 stud. These will be especially useful as a goalkeeper! If you find that the surface is hard, go for the FG version. In terms of which version to go for, they both fit similar size wise – so look look out and go for the best deal! Are these boots a wide boot ??? They are a similar fit to the adiPure II and III, the off centered lacing makes a slight difference but overall they are very similar! i am going to pre order the red ones from prodirect which are avaliable march 1 cannot Waitt. Because they are leather they will stretch a bit? So, on the adidas website, and on soccer.com, it says that they have hybrid studs that you can swap out with these, but is that true? If I wear a 9.5 in the first adizeros then what size should I get in these keeping in mind how much these stretch from the leather? Check out the Moving on from the adiPure III post – it should give you some added info! I actually noticed that also – but after checking out the studs they don't come off. So, I think they might be referring to another boot! Quick question, how long does it take for the upper to separate at the toe on this version? Has adidas fixed that problem yet? I know the 3's were a slight improvement but it was still inevitable. I haven't seen this problem with the III or the IV, so I can only assume it is improving! I know that these cleats are a bit heavier then most cleats these days, is the extra weight noticeable on the field? Hey Bryan. I was wondering how these boots are for striking the ball. Would you say you really notice a difference between these and the preds in shooting power. Striking the ball with the adiPure IV feels good. The makeup of the Pred means you are getting a completely different strike on the ball. Both feel good though. Do you notice any difference in striking between the adiPure 3 and 4? Just wondering if the redesign from off set lacing to centered lacing is noticable. There really is not much of a noticeable difference between both versions! Hey Brian, Ive been looking at the IV and had a question regarding the soleplate. I have a killer bunion on my foot that has caused problems in my arch and upwards to my knee. I have worn Predator Absolutes for the last four years as they have leather instead of the lacing part over the area of my bunion. I recently bought a pair of Predator X beacuse of the powerspine, hoping its rigid and does not flex as much as my Absolutes (which isnt too bad, my bunion is killing me at the end of 90 minutes from my foot flexing (think of my bunion as the worst turf toe ever x10 topped off with arthritis, dont worry its par for the course when you hit 40). Would you be able to tell me how stiff or flimsy the soleplate is on the Adipure IV compared to the absolute or the X? Id really like to get some kleather boots that will work for me as Im not so impressed with the Taurus on the X. Thanks! BTW, I do realise the lacing area will be on top of my bunion but with kleather I believe it wont be much of a problem. I don't know about the soleplate but the k-leather will definitely be noticably softer and stretch more for your bunion. Interesting new market idea though… motion control soccer cleats? Why not? They have them for running shoes. As @Roark pointed out, the leather will be softer…and you are going to get a little more flexibility from the more advanced soleplate on the adiPure IV. In my opinion, they would be a good option. Yes, they fit very similarly. What predators do you have? I have absolutes and they are 8.5. My regular shoe size is 8 and my adiPures are 8. Hope that might help. I found the Absolutes to run small. Just picked up these boots. I like the old school look, and they actually look even better in person. Let's hope they feel as good as my Predator Xs. Adipure vs. CTR 360 mastri, which offers best performance for an atacking midfielder? Which cleats are better for defenders, Adipure 4s, Puma Powercats, or Maestri 2 elites? @Connor- There's a big difference in the type of leather that is used. Adipures use K-leather and Adinovas don't. Get the Adipures if money isn't an issue, they will perform significantly better because of the leather. I have to go with what @Roark says – if money is not an issue, the adiPure is a much better cleat. Check out the Best cleats for Center Midfielder review, it should give you some additional info. Check out the Best Cleats for Center Back post! Hey Bryan I normally wear US9 in soccer cleats. I tried the 9US Adipure IV and they were too big for me (more than a thumb in the front). In the past I the Adipures III were perfect in 9. Do you find these new Adipures run a bit larger? Julian – thats interesting! I found they fit true to size and very similar to previous releases in the adiPure range. Were they definitely a 9? "To kick the review off, so to speak, I’d just like to point out that adidas very kindly supplied the adiPure IV in both our regular sizing and half a size smaller than usual – and after having a run out in both, we decided to continue the testing in half a size down"
hey bryan, do u prefer these over the vapor 7? which boot is better? thanks. Hi bryan, im stuck between getting the adipure III or IV. I found the adipure III on prodirect for $80 and i am a goal club member so i could get the IV for$125. i was wondering if the adipure IV are worth the difference. What would do? I prefer central lacing. The IV works better for my foot than the III. I have trouble with the asymmetrical lacing system; the shoe doesn't lock around my ankle. They are an updated version, so they are worth the extra money. But, in saying that, the adiPure III is a great boot and it seems like the $80 would be a very good deal! hi Bryan, i have the same problem as matt, im not sure if the adipure IV are worth $45 dollars more, i would be willing the spend more to get a better cleat but im always willing to save money. Which cleat would you get for the price? Best thing to do is wear an extra pair of socks, this should make things a little tighter. Another thing you can try is wrapping your ankle and using some additional pre-wrap around the back of your ankle, this will add a little more grip between your heel and the shoe. I currently am wearing puma v1.10 k’s, but am looking for a shoe that offers a better fit when they wear out. I was thinking about picking up a pair of legend iiis or adipure ivs. I have a pair of tiempo mystic indoors that fit my foot pretty well so I was thinking about getting the legends, but now I saw the adipure iv. I tend to have a problem where when I tie my cleats up the two sides are drawn up together to the point they are touching and cannot be tightened further. Anyways I am wondering which would offer the glove like fit and prevent this from happening. 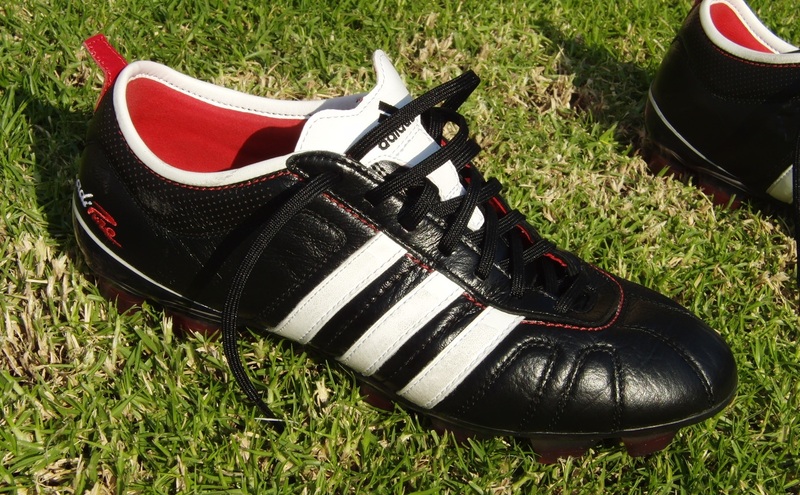 Also, what do you think of the adipure’s bladed studs vs the legend’s conical? I’ve only had cleats with bladed studs. I’d go with the adipures because tiempos use a material called kangalite which doesn’t change the weight of the cleats but by .13 ounces and it isn’t as durable and doesn’t mold as well either. Also the circle studs seem to mess up my cuts so I’d go with the bladed cleats. And the price is better for a pair of adipures. Hey Bryan, I just need to ask how these fit in comparison to the CTRs, I am going out to try on cleats today, and the store I am going to doesn't carry Adipures. I just want to go and get the right size, because I have bought cleats online before and I haven't got the right size. Thanks alot! Both fit in a similar fashion and are true to size. The leather upper on the adiZero offers a softer feel on the ball to start! Last summer I got the adipure 3 world cup Ed. They were good until this spring when the front became unglued and the front is falling apart. DOes this happen alot? What can I do? Warranty? I will need new boots for fall. Adipower are looking good. I've purchased boots on the adipure line for going on about 3 years now. I have always held that they are fairly easy to break in, very true to size, have excellent feel when shooting and passing, and have a good touch. I have however, had the same problem occur with each of the boots in the line since the Adipure II. After a few months the sole plate comes detached from the boot in the toe, leaving a gap in between the leather and the plate. I have tried numerous times to reattach them with everything from hot glue to industrial staples to no avail; it kept coming off. I would never tell someone not to try something out if they wanted to, as they might love a boot that you thought was rubbish. I will however, warn those of you who plan on wearing adipures on a consistant basis (2-3 sessions a week) that the boot isn't as sturdy as others such as the predator or the T90 laser. I currently wear the Adipure IV's in the white/blue colorway. Immediately after i put on my cleats, socks, and shin guards, it feels quite the opposite of what an Adipure should feel like (or what I've heard). It feels like no stretch at all and it is squeezing my foot to extremes. I guess I could say I have a wide foot and I like to tighten my cleats, but I wouldn't think Adipures don't fit wide. I've also heard that in the black/blue Adipures is very different from the other adipure releases because the shoe is thin. Could that be for the white/blue colorway also? I am just disappointed in the new adipure release, especially after buying not that long too long ago for the new season, when I could have waited for the new adipowers to come out, which look fantastic. I like this look better than the adipure III. 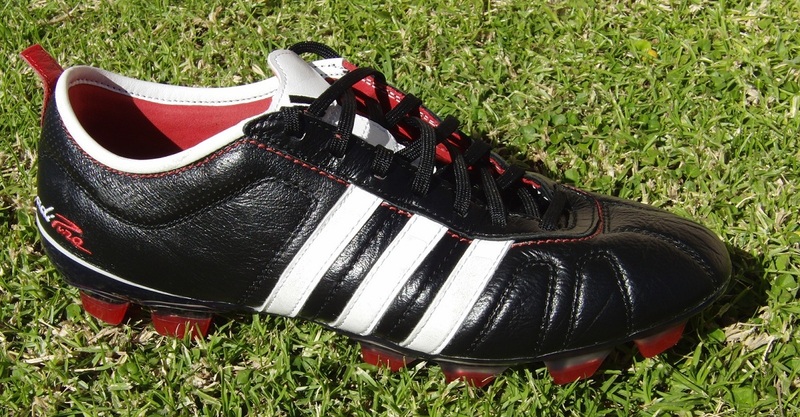 I had a pair of the adipure II indoors. I liked those a lot. I don’t know why they make the back of heel so low that your heel would hurt or slip. I hope my heel will get used to it. Copa Mundial heel is perfect, but its leather is too stretchy. Profi Liga is the best but they don’t make it any more. Also IV much lighter than III. Adipure IV is like the adizero. would u recommend these or a pair of the nike tiempo legend 4s i have the tiempo 3s and love them but wondered which you thought were better in terms of touch cutting ability and passing? oh and im a center mid that take free kicks and corners. It is honestly a toss-up. Both offer great performance benefits for midfielders and are very similar all around. My advice would be to take advantage of the best deal you find between both! I have just recently bought the AdiPure IV's and they are extremely heavy! if you are a fast player and want to keep it that way as i do, i do not recommend these cleats. Althought the comfort is actually great! I bought these boots a while back and have been using them for a month and a half 4-5 times a week. They are very sturdy, comfortable and offer excellent touch. They have stretched nicely fitting my wider foot. A big problem though is that the leather is starting to come out, leaving a gap at the toe between the sole and the leather. I haven't been using them very long, and having spent close to $200 on them the durability is questionable. my friend has had a pair of these for some time. He got new cleats, but when he brought his adipures to training, the kleather was stiff and rock hard. Can anyone tell me what causes this? My son is twelve and loves playing football but all his boots end up being too small after a few months. He is a size 7uk so would he be able to wear size 7.5 or 8? 7.5 should work perfectly, although if he is growing and you want to make sure he has some space to grow into, the 8 would be a better option. Hi. i play winger/offensive midfielder. What cleats should I get, these, tiempo IV’s or CTR360’s? Oh, and I take freekicks and corner kicks. There have been lot of rumors saying that after using the adipure 4 for quite a while it will tend to overstrech causing it to be not fitting anymore. Is this true? Hope that you will answer asap! Thank you! It wasn't something I encountered, and I still have them in use. It might be true for players who wear them in wet conditions a lot (resulting in the stitching becoming more loose), but this is pretty much going to happen to any leather boot that features stitching through the upper. if i wear a size 9.5 in superfly 3s, what size should i probably get in adipure 4s? It depends on how much room you have in the Superfly – the Superfly fits tight, while the leather adiPure offers some stretch, so a 9 should work out to be a pretty nice fit if you are snug in the Superfly. Something like Chelsea leather food works great – as long as you clean them and keep them dry, they will last. A cheap alternative is to use Vaseline. I tested them on turf with no problems. I purchased these in the Zero Metallic colorway. Though they looked amazing, I could not wear them. 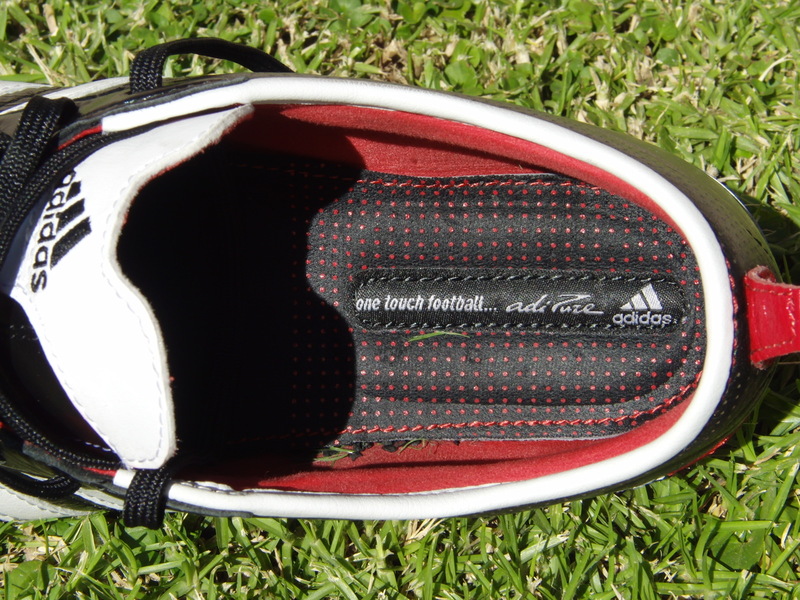 The sole plate under the arch is very narrow, similar to the AdiZero F50. After jogging for a few minutes, they started to really make my arch hurt. There was not enough support. I have the AdiZero F50's as well but they did the same thing. I have switched to the Mercurial Vapor VII. Really nice boot, but if I had my way and the AdiPure's were more comfortable, i would wear those. Bryan, when reviewing boots, could you possible specify and take photos of the sole plate? My Mercurial Vapor VII are really nice, but am looking for a leather boot for drier conditions on the pitch. Bryan, firstly, great site with excellent info..keep up the good work. Had a question regrading sizing, really for any boot but with the adipures in mind given that they all seem to run as you mention true to size. I am normally a size 9 however I do wear extra thick socks and ankle sleeves for a couple reasons…I tend to get stepped on quite a bit given the position and type of game I play but more importantly because of a previous achilles injury…so the softer heel area on the IV as mentioned had me leaning that way over the IIIs. When you say true to size, are you taking into consideration the socks or any other foot sleeve or brace? I’m trying to decide on whether to go up a size or half size or stay true to my size 9. Hey John – sorry for the delay, I missed this one. I always wear one pair of socks – so it wouldn't take into consideration any other apparel or necessary equipment. I keep things as consistent as possible so that I can say whether it fits "true to my expected size". So, if you normally wear a size 9US with double socks+ankle brace then these fit true to the size 9 you normally wear. In this case, since you wear a size 10US in the Ronaldhinos it seems that a 9.5US would be the way to go! Hope this helps. thinking of buying these boots online, but have wide feet does any one know if they are quite narrow? I have a question on fitting. I wanted to get these online but wasn't sure if they'd fit my foot. Is it wider than f50 prime? I hv f50 but my foot is standing on the edge of the outsole plate.it makes me blister every game. Any advise on which boot i should get? Best shoes for the price ever! You can get these for 60-70€ or even less. Very comfortable, nice control, good passing and shot performance.